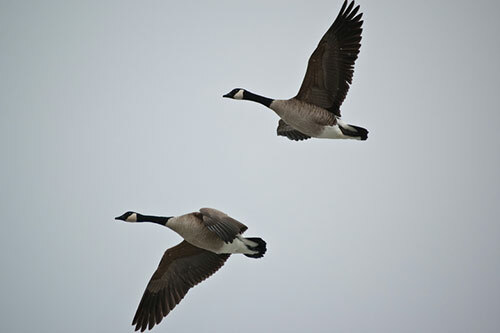 The flight of Canada Geese overhead is one of the tell-tale signs that the seasons have changed. They remind us that the world is in a constant state of change, and we must endure and persevere to reach our destination. Canada geese (Branta canadensis) are large, migratory waterfowl native to North America, although they have occasionally reached northern Europe by flying, and have been introduced in many other locations around the globe. 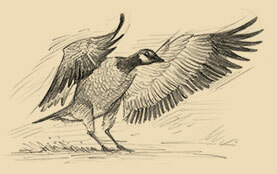 American Expedition is proud to present interesting Canada geese information, facts, and migration info. The Canada goose is the largest goose in the world, with the subspecies "giant Canada goose" having specimens weighing over 20 pounds. Typically, however, most full grown Canada geese weigh between five and 14 pounds, with females weighing slightly smaller than the males. Full grown Canada geese measure between 30 to 45 inches in length and have a wingspan between 50 and 75 inches. 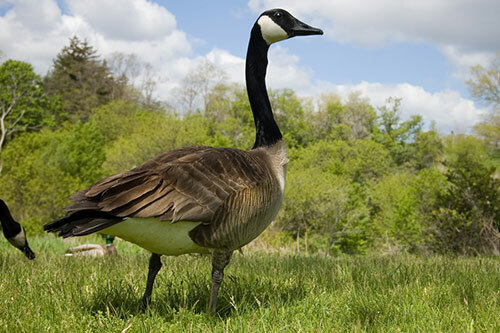 The Canada goose can be distinguished from other species of geese by its distinguished black neck and head, by a striking white "chinstrap" on the neck, and by a lightly colored breast and a brown back. Like other geese, they have an elongated neck, as well as webbed feet, and both of these adaptations make them quite agile in the water when they are going after food. Canada geese live around 10-25 years on average in the wild, although some may live to be as old as 30. One goose lived to be 40 years old in captivity. When a goose feels threatened, it will stretch out its neck and honk loudly. It may also hiss, bite, and slap at the perceived threat with its wings. Once every year, typically during warm weather, geese will molt their feathers, and will be unable to fly for a period of about 6 weeks. During this time they will stay close to water in order to have a means to escape predators on land. Canada geese were once in decline due to destruction of their habitat and over hunting, but their numbers have rebounded considerably. Canada geese breed in northern sections of North America, typically Canada and the northern half the United States. In some temperate areas it is warm enough for them to be year round residents of their range, and they may not migrate. Some groups of Canada geese have even taken up permanent residence in areas that would not seem hospitable to year round residency, as north as Esquimalt, British Columbia and as southern as Florida. 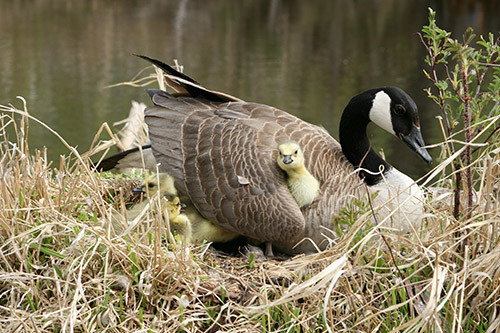 Canada geese like to select nesting sites on elevated, secluded areas near bodies of water like lakes, streams, and ponds. 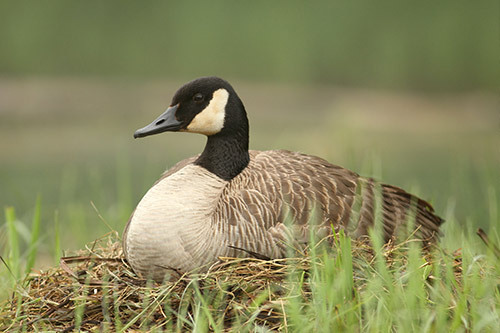 The female goose builds a nest lined with plant material and down that she plucks from her body, and lays an egg each day in until a full clutch of five or so eggs is laid. The male geese acts as a sentry, watching the nest from a nearby location. Canada geese primarily eat green vegetation, grasses, aquatic plants, and grains, but they do occasionally eat fish and insects. In urban areas, many of them will pick food off of the streets and even out of garbage cans. They have been known to be a pest for farmers, eating and damaging crops and fouling pastures with their waste. 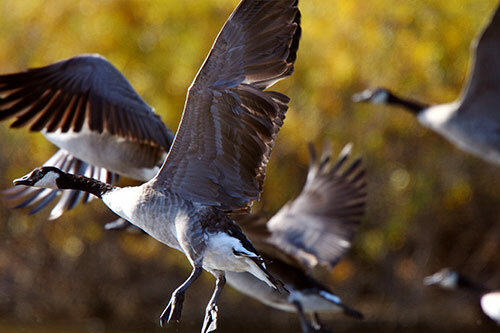 Canada geese migrate south from their northern summer habitats for several reasons. Canada geese need open water where they can swim away from land based predators and dive for food, and if lakes and ponds freeze over in the winter, they must leave for warmer climates. Peak fall migration for Canada geese occurs during September and October. Because Canada geese like to return to the places they were born, they will fly back during the spring. Not all Canada geese migrate, but many who make their summer homes in Canada and the northern United States do. Many Canada geese that are year round residents of their habitat are found in urban areas where their natural predators have diminished, and where there are man made bodies of water that may be warmed to keep from freezing over. During migration, Canada geese fly in a V formation, with each bird in line flying a little bit higher than the goose in front of it. One theory as to to why they fly in this formation is that it allows the lead goose to break the headwind, allowing the birds behind to "draft". 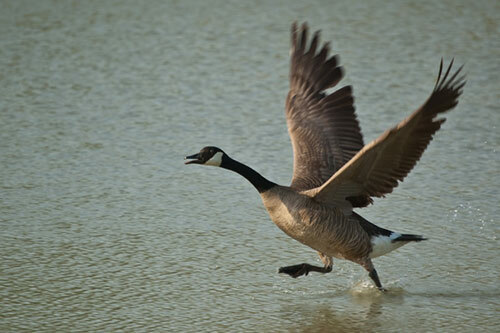 Canada geese communicate during their flights by honking, and will shift positions during their flight in order to take turns breaking the wind and reducing fatigue. Canada geese fly at an average speed of about 40 miles per hour when migrating, but may increase their speed to 70 miles per hour if they catch a strong tailwind. Migrations can be as long as 2,000 to 3,000 miles, and the geese are capable of flying up to 1,500 miles in a single day if the weather is good. 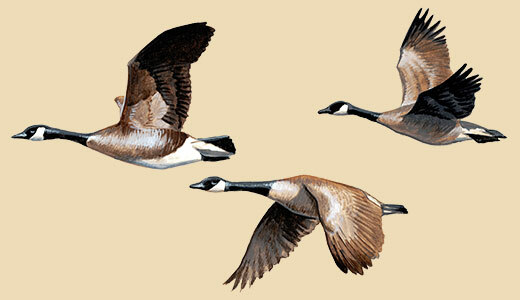 During their long migrations, Canada geese typically fly at an altitude of 2,000 to 8,000 feet, although pilots have reported sightings of Canada geese at altitudes of up to 9,000 feet. The above video shows Canada geese in migration. Because they are large birds, Canada geese may use a short "runway" to build momentum for water take-offs. 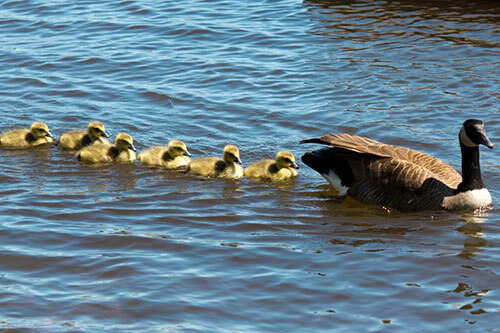 It is common to see young goslings trailing behind their parents. Goslings are highly impressionable, and mimic behaviors of their parents during their first weeks. 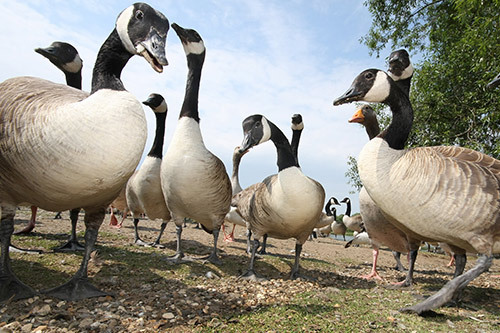 Canada geese may congregate into large groups for their migrations, containing between 30 to 100 in a group. Canada geese are well adapted to human civilization. Many of their predators habitats have been destroyed in the process of urbanization, and man-made water fixtures that don't freeze over, like lakes with fountains, provide them areas to swim year round. In some areas where they were formerly migratory, they have taken up permanent residence. 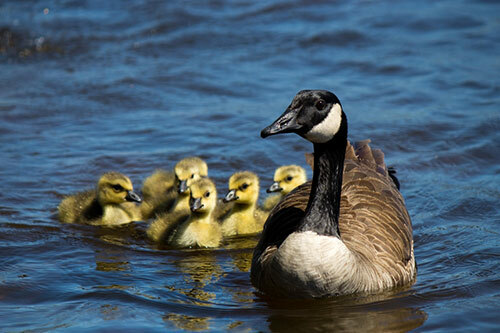 Canada geese are led to water by their parents shortly after being born, and after a day will be able to dive up to 40 feet under water for food. During their first few weeks, goslings will constantly be eating to become bigger. Canada geese like to select nesting sites on elevated, secluded areas near bodies of water like lakes, streams, and ponds. In some temperate areas it is warm enough for Canada geese to be year round residents of their range, and they may not migrate. Migratory Canada geese have been spotted at altitudes of up to 9,000 feet, and have been known to cause problems for commercial aircraft. 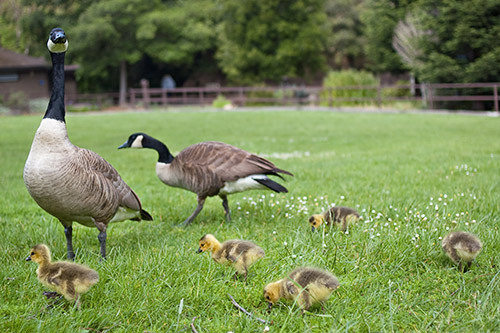 Canada geese are vigilant parents, and will violently attack anything that they sense as a threat to their goslings, including humans. 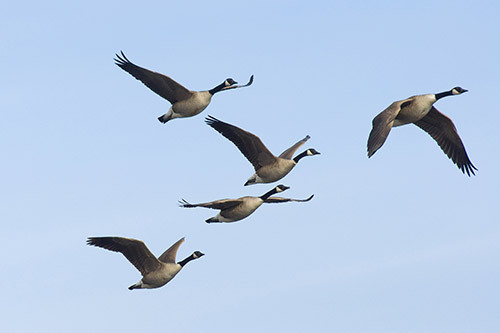 During migration, Canada geese fly in a V formation, with each bird in line flying a little bit higher than the goose in front of it. Interested in Canada Goose Gifts & Decor? 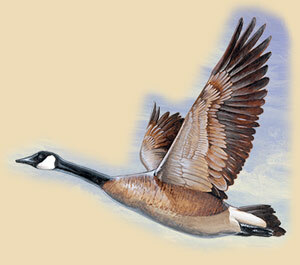 Visit the Canada Goose section of our wildlife store!